On May 9, 1916, the terms of the Sykes-Picot agreement were outlined in a letter between the British and French, with the actual deal signed one week later, on May 15, 1916. The agreement, negotiated by British diplomat, Sir Mark Sykes and Frenchman Francois Georges-Picot, aimed to divvy up large swathes of the Middle East that were at the time under the control of the Ottoman Empire, as the West believed Ottoman control of the area would not last beyond the end of World War One. The deal, which ultimately triggered a series of other similar agreements relating to control of the Middle East, loosely led to the creation of a border between modern-day Syria and Iraq, with many others arguing that it laid the platform for the creation of a Jewish state in Palestine. ​​Under the deal the French were to control an area extending from Southeastern Turkey, Syria, Lebanon and parts of northern Iraq, while the British would take control of the area consisting of the majority of modern-day central and southern Iraq, as well as Jordan. ​​​A third area, loosely based around today's Israel, was to become an Arab kingdom under a joint French-British mandate. 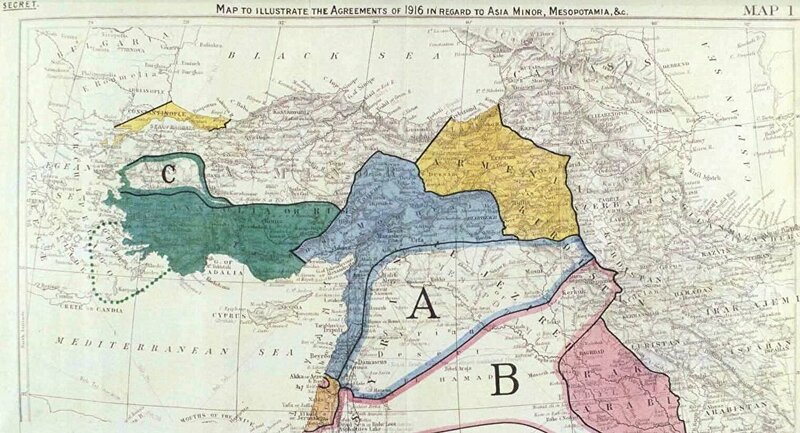 Critics have since slammed the carve-up of land, saying the Sykes-Picot deal largely ignored many ethnic and political divides, with many of the borders between French and British control drawn with a ruler. According to legend, Sykes' described his method behind the boundaries in a briefing with then British Prime Minister Herbert Asquith in 1915. "I should like to draw a line from the 'E' in Acre to the last 'K' in Kirkuk," he is alleged to have said, while sliding his finger across a map in Downing Street. While designed to prevent conflict between the British and French in a post-WW1 land grab, the deal has been blamed with fermenting sectarian violence across the Middle East. Adding to the infamy of the Sykes-Picot plan was the circumstances in which the deal was revealed to the world. Initially a secret agreement between the French and British, Russian Commissioner for Foreign Affairs, Leon Trotsky, published the details of the deal in November 1917, ultimately revealing the Sykes-Picot plot. ​While Russia's Tsarist government were a minor party in preliminary talks, the country's Bolshevik revolution transformed Russia's foreign policy, and Trotsky's leak was seen by many to reveal the imperial intentions of Britain and France. As a result, the deal has also come to resemble foreign control of the Middle East, with many researchers pointing out its relevance in prevailing anti-Western sentiment throughout the region. This was demonstrated by Daesh's leader Abu Bakr al-Baghdadi, who after sweeping through large swathes of Iraq and Syria in 2014, declared: "This blessed advance will not stop until we hit the last nail in the coffin of the Sykes-Picot conspiracy." And while the deal to divide up the Middle East has since been widely derided by experts and critics, it is clear the agreement is still having a very big impact on current events. Despite Iraq and Syria being divided along many internal religious and ethnic lines, with various different groups controlling swathes of land inside their respective countries, the international powers involved in today's anti-Daesh campaign are trying to maintain the borders loosely set-out in the 1916 agreement. There is a fear that a new demarcation of borders may trigger even more instability in the Middle East, highlighting the impact the Sykes-Picot agreement is still having on the Middle East — one century on.